This experiment did not involved extraordinary physics of billions euros machines. However it provides a precious information: all the stars are able to host a form of life based on photosynthesis. Seeing this, I thought that this contribution deserved to be known and highlighted under the form of a science paper, with peer referee and publication in a specialized science review. This is where the oddity popped up: I got no replies. Not even a rejection, just nothing. Ok, this is just too bad for such an interesting result, but it is not something that I can solve. So I publish this study here, as a result of my «Shedrupling University». Since twenty years that this site exists, it should be universally known (it was created before Google, this says it all). And at random, if you are editor in a peer referee science review, it is not too late. I am online normally every saturday at 20TU, or noon SLT, with the name of Yichard Muni, in DiscoveryGrid (3D viewer here) I also am in Discord, Mewe and facebook, as Richard Trigaux or Yichard Muni. So here is the text, while remembering that it was intended to be a science paper. But this does not entail it has to be ugly, so that I applied the same styles that for the remainter of this site. See the ritual version in .pdf. Testing photosynthesis with the light of an ultra-cold red dwarf star. Caution: this is for submission, this study has not been peer reviewed. The discovery of several planets in the Goldilock zone around the ultra-cold star Trappist-1 suggests that red dwarves planets may be numerous in the Universe around us. This arises the question if intelligent life is possible on such planets. One of the elements of the reply is to know if photosynthesis is possible with such cold stars, as photosynthesis seems a mandatory prerequisite for evolved life. The experiment was simple to do: build a Trappist-1 light simulator, and try to grow Earth plants with this light. It worked well, and the weight of dry matter after seven weeks of growth was 25 times the weight of the seeds. So the coldest red dwarf stars are not barred from intelligent life, regarding the photosynthesis criteria. We also reflect on the possibility for a Darwinian evolution path, toward a chlorophyll adapted to near infrared light. At last, an interesting conclusion is that a chlorophyll adapted to infrared would have a different spectral signature of Earth Chlorophyll, constraining the search for life by optical or spectral means. Evolved life necessarily uses some sort or another of muscles, and brain. Both are high consumers of energy. This requires a large energy source widely available in the biosphere. The only one fulfilling this criteria is solar light. This makes that photosynthesis is a very strong prerequisite for intelligent life on any planet. Photosynthesis produces simultaneously a fuel and an oxidizer, which arrive to intelligent organisms by separate paths. On Earth, the hydrocarbon fuel arrives by food, and is stored in the body. Oxygen is massively available in the air. This situation allows for the fast availability of energy, without having to store both reactants (Organism storing both would be high explosives). But other combinations would work too, like a hydrocarbons atmosphere and nitrates food. Problem, photosynthesis uses high energy photons, above 800 nanometres on Earth. This already makes only some percent of the Sun Light energy available for photosynthesis, and this proportion is much weaker with red dwarf stars. We can consider that organisms on red dwarf stars would adapt to use infrared photons, but this hypothesis cannot be checked simply. We shall discuss further this possibility, but in theory only. The proposed experiment here is to see if the few energetic photons in Trappist-1s star allow for the growth of Earth plants. If the reply is yes, this sets a substantially higher value to the ne factor of the Drake formula. The experiment uses a Trappist light simulator, which is the only light source for a cultivation test of a common Earth plant. Trappist-1 being at 2512°K, and the budget of the experiment being near the absolute zero, the simple solution was to use an incandescence light bulb, suitably derated to reach this temperature. Both the bulb and the star being good approximations of a black body, the two spectra were matching well enough. Actually this was not so simple: after buying the last incandescence bulbs in shop before their interdiction, I ran in another difficulty: impossible to put a hand on a thermocolorimeter. The closest was 150kms away, in a photography school in Toulouse, and they understandably won't let an amateur use it. So the solution was to use a derating curve, giving the color temperature as a power law of the voltage: color temperature is approximately proportional to V at a power of 0.42 (Fink and Beaty, ). Of course this curve is such that we get the rated color temperature at the nominal voltage. The bulbs were two halogen incandescence bulbs, Branded Osram, type HALOLUX T 40 W 230 V E14, intended for domestic use. They are rated for 40W and 2700°K at 230 Volts. Because of this low wattage, two were used. The above derating formula gives 194V feeding voltage to reach Trappist-1 temperature. However, without direct control on the color temperature, the errors of the voltmeter (Metrix 202B, given at 2.5% accuracy on alternating current), unpredictable changes in the network voltage (from 232V to 236V, after the previous voltmeter) and an unspecified inaccuracy on the derating formula, the target voltage was finally chosen at 176V, supposed to give a temperature of 2400°K, that is 4.6% lower. This way, all the inaccuracies are on the same side, and even in the worse case the conclusions will remain valid. A dimmer could not be used to lower the voltage, since it would not provide a sinusoidal waveform, making the voltmeter reading not valid. For this reason, a ceramic rheostat was used instead: 25 Ohms, 25 watts, in series with the two bulbs (mounted in parallel together). This rheostat was enclosed in an earthed box for safety, and junctions made in a standard derivation box, including banana jacks for the voltmeter. By the way, if anybody tries to reproduce this experiment, I recommend using a regulated DC voltage source for the lamps, and to calibrate the temperature with... quite simply one of the spectrometers used to measure the temperatures of stars. Indeed, thermocolorimeters used in photography may finally be less accurate than the setting of this experiment (for instance one of the best available today, Sekonic C-700R, has its accuracy not specified). At this point, a test plant had to be selected. Since nearby all plants have the same cutoff wavelength near 800 nanometres, any could be used. A practical choice was radishes, often used for their fast growth in children learning: «radis de 18 jours» (18 days radishes), half long, brand Delbard, batch number 10G GC1108, expiry date 07/2021 (experiment made in 2018). A dark enclosure was needed too. But the lamps were producing a lot of heat, so that the experiment finally landed in a dark cupboard instead. The two bulbs had an aluminum foil reflector, and were placed at about 15cm above the earth level in the cultivation tray. This excess of heat compared to light must certainly be a real problem on a red dwarf's planet: either illuminated and too hot, or tepid but dark. This is the reason why infrared photosynthesis must be a definitive advantage. This makes that, in average, each radish created 25.5 times the weight of its original seed, as a result of an efficient photosynthesis, without any other possible cause. Even one of them had flower buds. For comparison, it is said that plants grown in the dark die after some days. The results were curious, though: none developed a bulb. 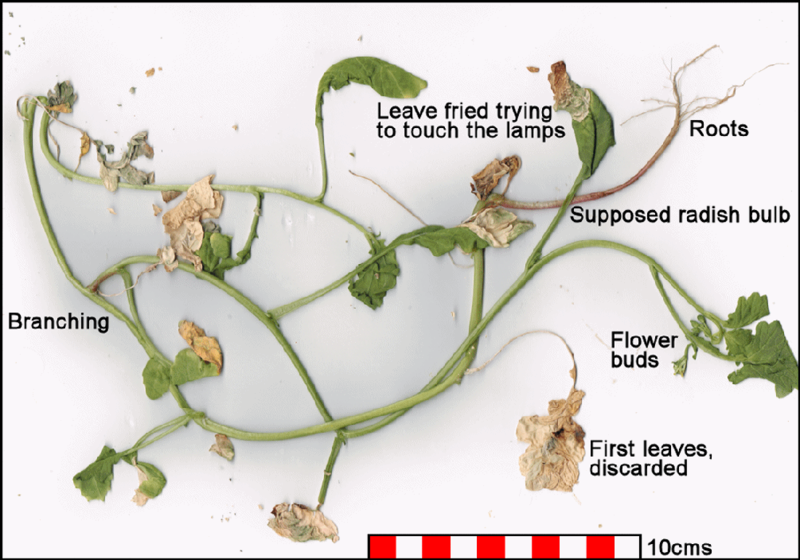 Instead, they developed stems, which usually do not exist in radishes. One of those radishes had developed more than all the others together, 70cms of stems, with even a branching! We can interpret this result as a «low light mode» or «light search mode», that we usually do not see in radishes. It finally elected not to develop a bulb, keeping its low energy supply for reproduction only. Plants living on a red dwarf planet will certainly experience similar difficulties, and overcome them in various ways. Significance for the Drake formula. This result does not allow do derive any absolute value to any factor of the Drake formula. But it brings a relative change to one of the factors: ne, the proportion of planets which can harbor life. -4 % of blue stars, which have too short a life, so that we do not count them in ne. -76% of red dwarves, which habitability is questioned. These figures show that ne with all the red dwarves is 4.8 times higher than ne with only Sun-like stars. This translates as our closest inhabited neighbor being 1.69 times closer (statistically of course). A figure which also brings several years closer the predictions for finding intelligent life (by whichever method). Theoretical possibility of an infra-red photosynthesis. On a planet of a red dwarf star, at equal temperature and infrared heat received from the star, there is much less useful light energy available for photosynthesis. For this reason, infrared photosynthesis could bring a real advantage, by capturing more useful energy. We reflect here if such a thing is «technically» possible. Normally, only energetic photons can break molecules like H20 or CO2. What makes photosynthesis possible on Earth is the very lucky fact that four photons can combine their action to break two H20 molecules into 02 and 4 H+. This allows to use photons of half the required energy. The voltages levels are (likely) determined by the difference of potentials between the different compartments of the cell. The two vertical upward jumps (grey) are determined by the energy of the photons, while the vertical drops are determined by the energy consumed by each endothermic chemical reaction. 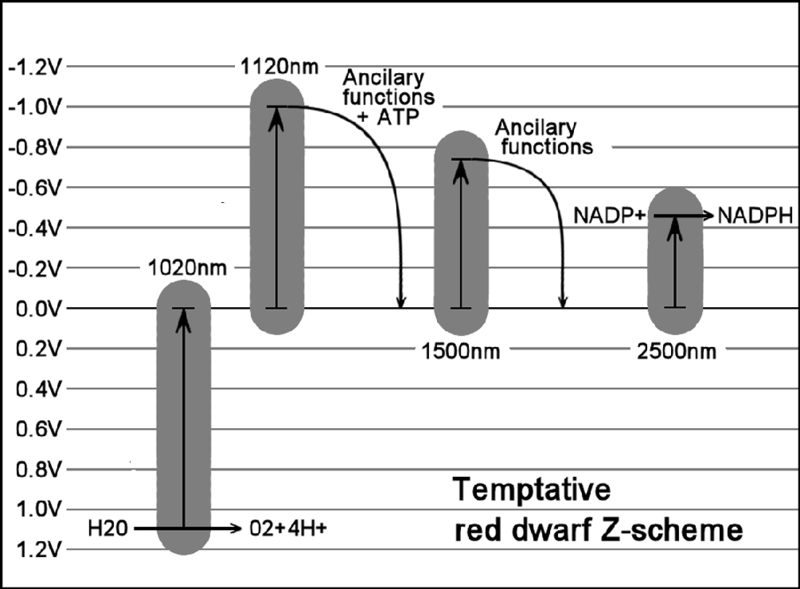 This alternate diagram allows for photons of as low energy as 1120 nanometres to be used, which are clearly in the infrared. Even 1500 nanometres photons can contribute to part of the energy. This is a temptative diagram, using Earth chemistry, but a different architecture of the cells, with different difference of potential between the compartments of the cells. We can imagine many other diagrams, with different chemistry, and different potentials. Our point here is just to show one which can be expected to work, energy-wise (or voltages-wise). On Earth, photosynthesis quickly evolved in the Archean age, finding ways to break harder and harder molecules. Date of first oxygen is debated, between 2500 and 3500 millions years ago (This covers about the whole Archean age). But since, photosynthesis did not changed further, save for minor color changes in the molecules. Such kind of situation indicates a deadlock in evolution, as it reached an optimum. There could be other optimums, for instance in the infrared. But evolution cannot go backward, to try again to find a better path. On Earth it did not needed anyway, since the found solution was working. However in red dwarves's planets, we can conceive that there is a much higher selective pressure toward infrared photosynthesis. 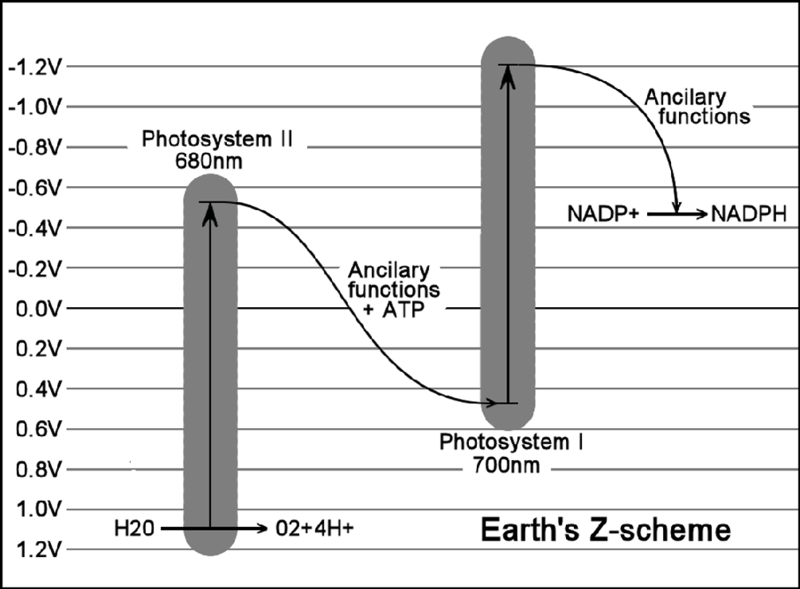 So if a solution exists, like the modified Z-scheme above, it is more likely to be selected by a standard evolutionary process, as soon as the equivalent of the Archean age on this planet. The problem here is that, the more we go in the infrared, the more the atmosphere is opaque. In water, this is even worse (IR absorption curve, after Chaplin, Martin, ). At 1000 nanometres, infrared light is absorbed in a dozen meters. At 2000 nanometres, infrared light is absorbed in only part of a meter. At 3000 nanometres, infrared is absorbed in millimeters. This continues until as low energy as the millimeters wavelength: water is very opaque to anything save very near infrared. Since life must appear in water, at a minimum depth of some meters (to account with the presence of waves and tides), this brings a cutoff frequency to infrared photosynthesis at something like 1500 nanometres. To give an idea, the small absorption of visible red light in water is already enough to constrain the living depth of photosynthetic organisms on Earth (Chaplin, Martin, ). So infrared must be much more constraining. It is worth noting that on Earth, plants all appear white in infrared, since they accept no photons there. This has an influence on the Darwinian evolution of vision: there is no point at seeing in the infrared, since everything looks the same. However on a planet with infrared photosynthesis, it is likely that plants have different colors in the infrared. So there is a point to have infrared eye cells, and even a need. This is worth knowing, when we shall be able to detect vegetation with a telescope: On Earth, detection of plants from space uses their conspicuous infrared signature. But this signature is not necessarily valid on a red dwarf planet. But if we go farther in the infrared, water becomes strongly colored and even opaque. The air itself would be colored with moisture. So that vision reaches about the same limits than photosynthesis. The experiment shows that photosynthesis is possible on any red dwarf star. This makes that all red dwarf stars can be target for any search for evolved extraterrestrial life, by whichever method including SETI. This statistically brings our closest neighbor 1.69 times closer. The possibility of an infrared photosynthesis seems limited to the close infrared (around 1500 nanometres), for several reasons. While probable, and a definite advantage, it is not mandatory for intelligent life. At last, a Chlorophyll adapted to infrared would have a very different spectral signature in the near infrared (800 to 1500 nanometres). Especially it would lack the obvious luminosity of Earth plants at these wavelengths. This signature would be shifted beyond 1500 nanometres, and this constrains the methods to find extraterrestrial life, either by direct observation or with spectrometry. (Internet resources being volatile, I encourage everybody to keep record of this page).